This point is worth stressing: since 2016, there has been no national polling on anything resembling the "intensity" of support for Bernie Sanders. There have been occasional favorability polls, but they measure whether people like Sanders - not how much people like Sanders. What we specifically need are polls that ask for ratings like "very" or "somewhat," and most polling firms stopped asking questions like that when the 2016 primaries ended. Until they start up again, there's really no reliable way to tease the information we need out of the available data. 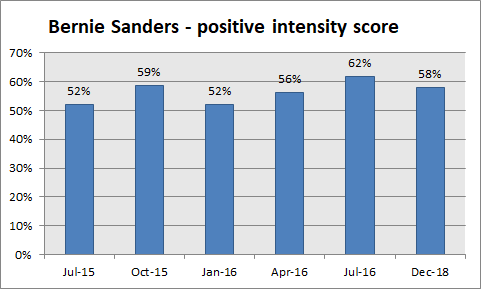 Sanders' positive intensity score simply tracks what percentage of his favorable ratings are "very favorable" (as opposed to "somewhat favorable"). I pulled the 2015-2016 numbers from Yougov / Economist polls of Democrats, and the 2018 numbers from the December CNN poll that Nate Silver used. My reading of this poll is that not much has changed. The intensity of Sanders' support has always drifted around within a 10 point range - 52% when people barely knew him, 62% when Democrats were in full-on convention mode. Right now, his support is a bit higher than usual, but nothing extraordinary is happening. My guess it that these numbers will probably continue to fluctuate within this range in the coming months. To the extent that they pay any amount of attention to the numbers at all, opponents of Sanders in the media will probably blow the statistically inevitable drops way out of proportion, and maintain conspicuous silence about the inevitable rebounds. Regardless: if the Iowa numbers mean anything, they mean that Sanders is doing just fine.